When the partners of Rahn+Bodmer Co. say they are private bankers, they mean this literally: the partners - who have pledged their personal assets and jointly and severally assumed unlimited liability - have for generations borne overall responsibility for Zurich's oldest independent private bank. They are active in the bank and also personally involved in relationship management. Rahn+Bodmer Co. specializes in investment advice and asset management primarily for private Swiss and international clientele. In addition to preserving the value of its clients' assets, it also seeks to optimize its investment income, managing an acceptable level of risk in line with each client's personal risk profile. In addition to its know-how in the fields of analysis and portfolio management, Rahn+Bodmer Co. has many years of experience in stock-exchange and foreign-exchange trading. Rahn+Bodmer Co. also carries out stock-exchange transactions for institutional investors and other banks, who appreciate, as R+B’s private clients do, its reliability and trend-setting automatic order-processing system. 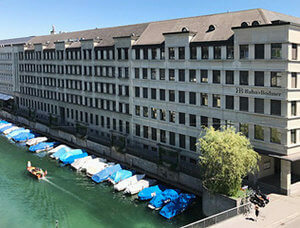 The bank is a member of SIX Swiss Exchange.